Interested in talking with other hard working, talented people about making beautiful, useful things? 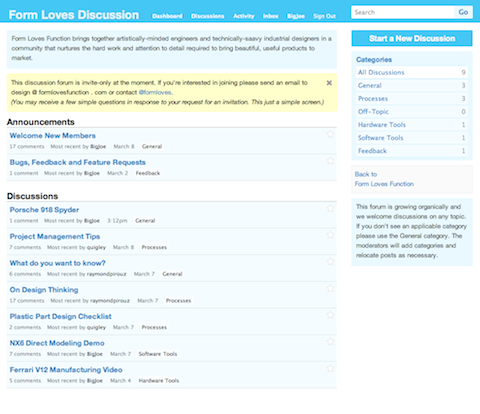 The Form Loves Function discussion forum is ready for action. At the moment it is feature-lean; more features will be added as the community builds. If you are ok with answering a few screening questions and dealing with some minor bugs, please request an invite by hitting me on Twitter (@formloves) or via email at design at formlovesfunction dot com.